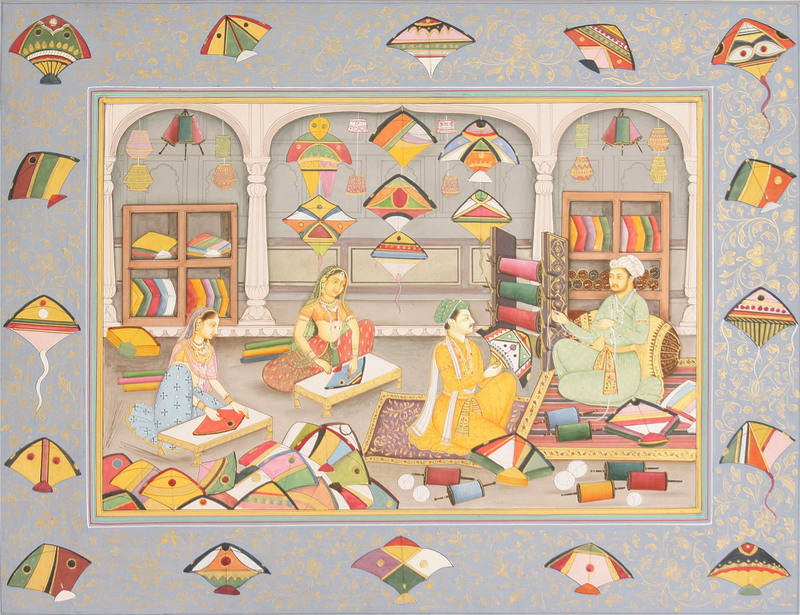 This miniature, contained in a magnificent framing space embellished with variously designed kites painted over a blue-grey background, which floral arabesques rendered over it in subdued tones of gold define, portrays a kites-seller’s shop with a well dressed youth, perhaps a courtier, buying kites. With an exceptionally colourful kite in hands the young courtier, a lustrous youth, wearing a deep green Jahangiri turban with a lace of pearls adorning it, a saffron ‘choga’ woven with red silk buti, white sash and a rich golden waistband, and a few selective ornaments of pearls and precious stones, is seated on a specially laid carpet conversing with the shop-owner, perhaps seeking his assurance in regard to the quality of kites and thread that he was buying. The elderly shop-owner, clad in an alike patterned turban, ‘choga’ and ornaments, and seated against a huge bolster, is not any inferior to his customer. Pulling the thread from one of the spindles lying besides him he is elaborating the thread’s strength and fineness. Besides the shop-owner and the youthful buyer, the shop also has two female workers busy in manufacturing kites. Each has before her a sofa table-type small low-height working table elegantly painted with gold, and behind her, rolls of variously coloured paper of which they are making kites. There lay beside the lady on the extreme right a bunch of fine bamboo slivers used in making a kite. On the other side of their tables they are piling the kites that they are making. These currently manufactured kites apart, others lay in wooden racks or on the floor but arranged systematically in bundles. A few with rare design and craftsmanship, as the one designed like a human figure in multi-coloured ensemble, another, like a colourful butterfly, or yet another, like a colourful top, have been put on display against the shop’s arched doors. The total breadth of the shop has been manipulated by three arched openings, the central one being wider than those flanking on the sides. The thread used for flying the kites is also on sale. There is on the right side of the shop-owner a large size wooden stand embellished beautifully with gold arabesques. The bulks of thread have been reeled on its spindles which are quite large capable of storing a lot of it. The usually required lengths are rolled on small wheels, some of which lay on the floor while others, in the rack behind the shop-owner. The painting reveals strange medieval or rather Mughalia ambience in every thing, the style of costumes, architecture, painting style and even palette. The males’ turban is in exact Jahangiri style, while ‘choga’, ‘pataka’ – waistband, and sash, the wears of males, and lehengas – petticoat-like long skirts, odhanis – an unstitched large sash-like upper covering, and cholis – short blouses, the wears of females, are largely in styles prevalent under Shahjahan’s reign. In architecture : the fluted marble columns and arched apexes, and wall-decoration with alcove and ‘mehrab’ motifs, and in patterns of arabesques, the Mughal character is well pronounced. In the execution of the painting, in its technical maturity, in precision and accuracy in rendering details, fine lines and every form, aesthetically sound iconography and graceful figures, and even the choice of colours the painting reveals similar heights as a seventeenth century miniature from the Mughal court atelier.